updates to the module do not break its dependents, as long as they are released under new version tag. For example, a graphical calculator application might start as a main module, that depends on the arithmetic module and on the command line interface, both developed in parallel with the main application and hosted at a public repository. Let's say the arithmetic module adds more testing, fixes internal bugs, maybe even refactors its public interface, then releases version 0.0.2. The main Calculator app does not have to switch to the new version right away, and might never do this at all! Immediately, we see the problem with highly modular development: each module always keeps falling behind. Its dependencies keep releasing new versions, adding features, fixing bugs, maybe reacting to hardware changes, or even to the changes in their own dependencies. I often use a lot of 3rd party dependencies in my projects, mainly because I hate writing code that someone already has designed, written and tested. For example, my project xplain that generates API docs from unit tests uses 20 3rd party libraries. An important reason to keep your dependencies up to date is security. Tools from nodesecurity projects like grunt-nsp-shrinkwrap and grunt-retire warn you if a dependency has a known security risk and should be upgraded. I perform these tasks often enough to automate them. next-update by default runs npm test command, but you can specify any command to run as an option. I run free anonymous update stats service at next-update.herokuapp.com. 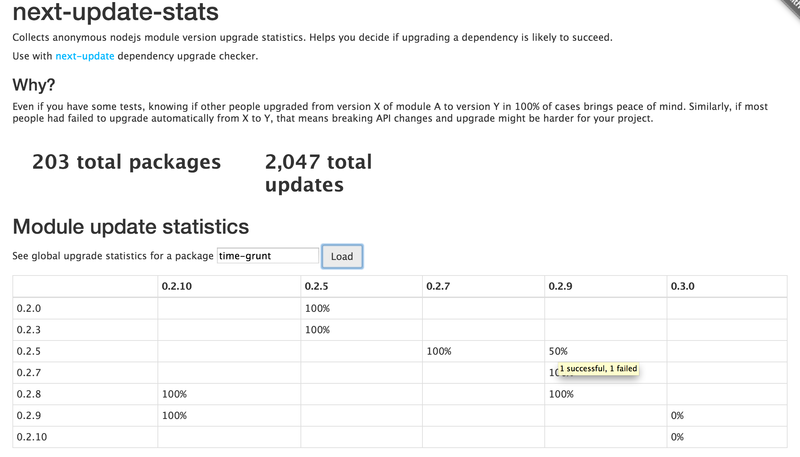 Anytime next-update tests going from version X to Y of dependency N, it sends the result (true/false) to the stats service. Then you can lookup how likely a particular update is based on overall results. A CLI tool that uses next-update to update multiple repos / NPM modules. The above command will update all packages by user bahmutov. Only minor and patch versions of dependencies will be checked. If upgrade is successful, new version will be tagged and published to NPM. The next-updater makes keeping multiple projects up to date a breeze. Keeping human readable log file with your project is a good practice, and I suggest using git changelog command that comes with git-extras to make it super simple. dont-break solves the opposite problem. It checks if the current working version of a package breaks any dependent module (either specific or top NPM downloads). Checks if the module in the current folder does not break tests in the top 10 most downloaded dependent projects. Useful to check before publishing new version. I use next-update a lot in my projects, and usually most projects with clearly defined stable public interfaces do not break my applications. I update the dependencies as soon as tests pass and next-update approves. Sometimes, if I am hesitant, I look up changes using changed to see if the effort to fix my project is worth the trouble. It would be very nice to automate the combination next-update + update all dependencies that do not break the tests. It could be a continuous integration job, running extensive tests, and committing the updated package.json after successful updates. answer I wrote next-updater to update multiple repos / npm packages at once. The information is always pulled: calculator checks if a newer version of arithmetic is compatible or not. It is up to the dependent module to find the reason for the breaking build and fix it. The author of arithmetic has no idea that he broke a dependent module. In case of enterprise development, where teams develop modules in parallel, I would like to have a system that collects information from the unsuccessful next-update attempts and transmits the information upstream to the breaking dependency's author. This would make the integration and convergence process faster. In a single application, due to transitive nature of the dependencies, you might end up with several versions of the same module. NPM allows this, it will try to use the latest version (I think, the found info seems to contradict what I see during installs). It would be nice to run next-update recursively to get to consistent state along the entire dependency tree.